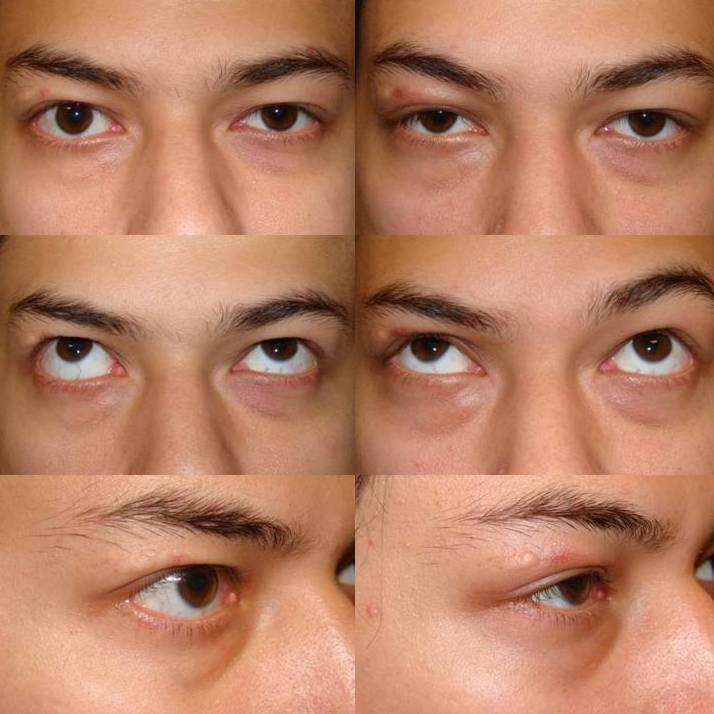 Eyelid Paralysis (paresis) can result from Bell’s palsy or a variety of other causes of facial nerve injury (facial/eyelid paralysis/paresis). This typically results in an eye that cannot close, ocular irritation, dry eye, a red eye and tearing. In addition the lower lid tends to droop (retract). This adds to eye symptoms and is cosmetically a problem. The difficulty in correcting the lower lid retraction (droop) is that most procedures require surgical manipulation (cutting) of the lower lid muscle which closes the eye (orbicularis oculi muscle) and the outer corner of the upper and lower lids – the lateral canthus. These steps can weaken the lids further, cause scarring, and alter appearance in a negative way. Dr. Massry has devised a better solution for eyelid paralysis patients whether from Bell’s palsy or any other cause of facial or eyelid paralysis (paresis). Dr. Massry has called this procedure the Minimally Invasive Orbicularis Sparing (MIOS) technique of lower lid elevation (recession) for eyelid paralysis/paresis. In this procedure the lower lid is elevated (recessed) by releasing the lower lid depressing muscle (to allow unopposed elevation) from the inside of the lid (transconjunctivally). 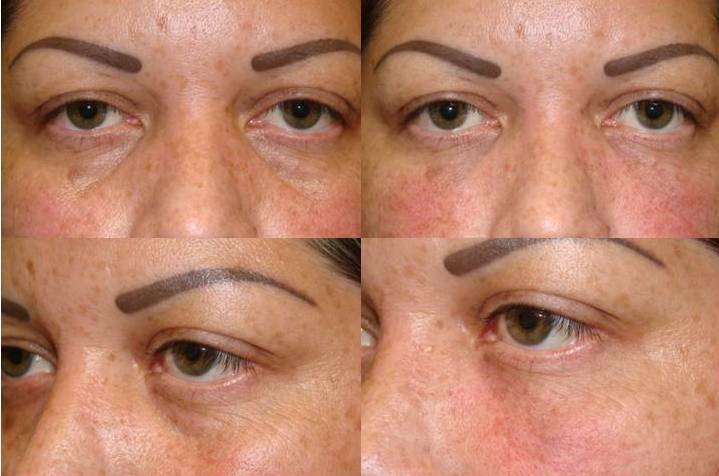 The lower lid is then tightened (suspended) from an outer upper lid incision typically used in standard cosmetic lid surgery (blepharoplasty). In this way the lid tightening, or canthoplasty, and lid elevating, or lid recession, procedures are both performed with hidden incisions, no scarring, and most importantly no trauma to the lid closing muscle: the orbicularis muscle. Two years ago I had a doctor accidentally sever my 5 and 7 facial nerve during a jaw surgery... He told me it would come back but it never did. So for 2 years I had to battle with the depression of living with the right side of my face completely paralyzed. I was unable to blink or smile or protect my eye at all. It took me two very hard lessons of going to general surgeons to learn you can't think of not seeing a specialist when it comes to your health and safety... So I consulted the offices of Dr. Guy Massry, a specialist in eyelid paralysis surgery. Immediately I was blown away with the high standards of professionalism there, it was like night and day. They are very prompt, cordial, informed, and dedicated to their patients... Dr. Massry didn't just perform a surgery on my eye... He performed a miracle! I am SOO much happier now that he fixed my eye. You would barely even notice a difference between the two! It has made me much more comfortable to be in public and it's like he has given me my life back again! Plus he was always just a phone call away if I needed anything at all which if you know IS NOT the case with a lot of other medical practices. Overall, I'm glad I found out about Dr. Massry and I would fully recommend him to anyone else who suffered with facial palsy/paralysis like I did.